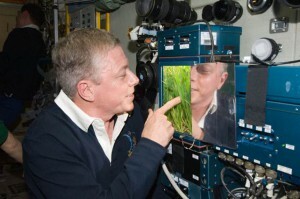 In today’s A Lab Aloft, Charlie Quincy, research advisor to the International Space Station Ground Processing and Research director at NASA’s Kennedy Space Center in Florida, continues to share the growing potential of plants in space and the new plant habitat that will help guide researchers. As astronauts continue to move away from Earth, our ties back to our planet are going to be strained. We won’t have the capability to jump into a return capsule and be back to Earth in 90 minutes. To move further away from Earth, we have to continue to develop more autonomous systems in our spacecraft that supply our fundamental needs for oxygen production and carbon dioxide (CO2) removal, clean water and food. The genetic coding in plants to perform these functions has been refined and improved for the past 3-4 billion years as plants have continually evolved on Earth. So the code is pretty good. As long as we can provide biological organisms like plants or algae with the nutrients and support systems they need, they will pretty much know what to do. What they will do is clean water, change CO2 into oxygen and generate food. From a life support system, that’s kind of what you want to happen. There are some interesting things about plants that we’ll have to deal with in space. For instance, we don’t have bumblebees in orbit, so who does the pollination? Who goes from flower to flower? We’ve actually had astronauts using cotton swabs to move pollen from one flower to another, in particular when we were growing strawberries a few years back. As we get more and more into it, we need to figure out how to do this without using the crew, since it would not be efficient to have them pollinating a field with cotton swabs. We have quite a number of things going on and coming to fruition on the International Space Station. 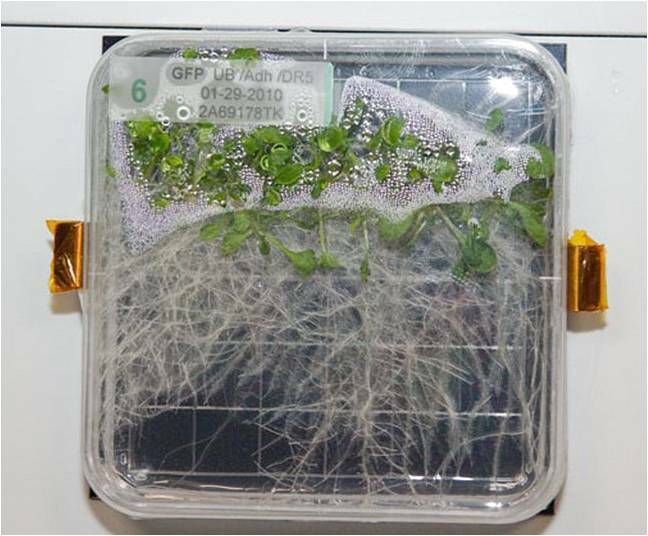 We currently have a small habitat called the Advanced Biological Research System (ABRS) in orbit performing fundamental studies of plant growth in the microgravity environment. It has two independent chambers that are tightly controlled and have LED lights. We can manage moisture delivery, CO2 and trace gases inside those chambers and do some real hard science investigations. The Russian segment has a habitat, too, called the Lada greenhouse. The Advanced Plant Habitat (APH) is a similar chamber under development, but that one will be larger. The APH will enable us to use larger plants and different species, all of which will be tightly controlled during growth investigations. Another really exciting new system launching to the space station probably around the middle of next year is the Vegetable Production System (Veggie). It will begin bridging the gap between a pure science facility and a food production system. We are in the ground testing phase of the flight unit to assure it is safe for operation aboard the station with the help of the facility’s builder, Orbital Technologies Corporation of Madison, Wis. Orbitec. They also will manufacture the APH. The beauty of the Veggie unit is that it’s really just a light canopy with a fan and a watering mat for growing plants, using the cabin atmosphere aboard the space station. The crew will have an opportunity to farm about two and a half square feet, which is a pretty good sized growing area. This system also has great potential as a platform for educational programs at the high school level, where students could grow the same plants in similar systems in their classrooms. We’re going to start growing lettuce plants in Veggie next year as a test run, because lettuce is well suited for this initial testing. Lettuce is a good first crop selection because it is a rapid growing plant, with a high edible content, and generally has a small micro flora content. We will be using specially designed seed pillows to contain the below ground portion of the lettuce plant containing the roots, rooting media, and moisture delivery system. The plants will sprout and grow up through those pillows. 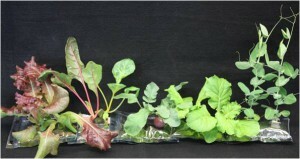 Ultimately scientists will be able to grow larger plants like dwarf tomatoes or peppers. 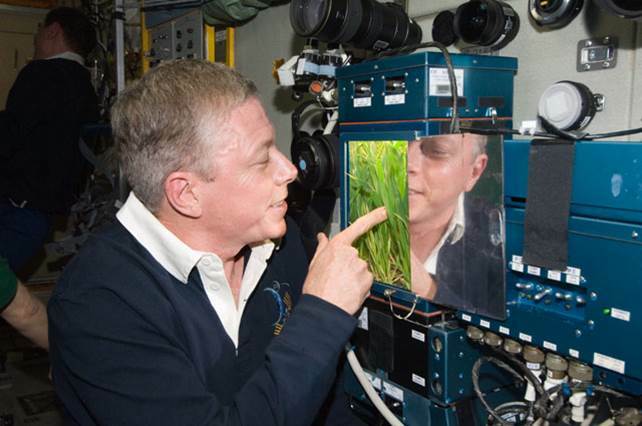 We are continuing to do the testing associated with making sure the food grown in the closed environment of the space station is safe to eat for the crew. We hope that within a short period we will be able to augment the astronauts’ diets with herbs and spices and maybe onions, peppers or tomatoes, something to give the crunch factor. Ultimately, we hope to move to even larger chambers to begin producing more of the staple crops, such as potatoes or beans. All of these new plant systems should be up and running in the very near future. Veggie should be aboard station next year, and by the middle of 2015 we expect to deploy the APH, completing the suite of plant facilities in orbit. When talking about life-support systems for spaceflight, there’s obviously a more complicated viewpoint that says the systems that connect all that together are pretty elaborate and cumbersome. There are reservoirs, hoppers and a vast array of other things that have to be in place to operate a bioregenerative system, which makes them big and, in some cases, energy intensive. On short-duration missions we would probably do better packing a picnic lunch and taking only the support systems we need. The further we are away from Earth, and the longer it takes us to get back, however, drives systems planning in the regenerative direction. What we’re doing is laying the groundwork that will enable those kinds of decisions to be made for long-duration exploration. There’s a more near-term thing that we’re also looking at, which is the therapeutic aspects of growing plants. People have been exercising their “green thumbs” for this reason for years. They plant their little gardens, and the aromas of plants have a very positive impact on the way these people feel about things. The psychological effects of keeping plants are still somewhat unknown, and we’re hoping to get better insight into that. These effects include the nurturing aspects of watching something grow and caring for it. 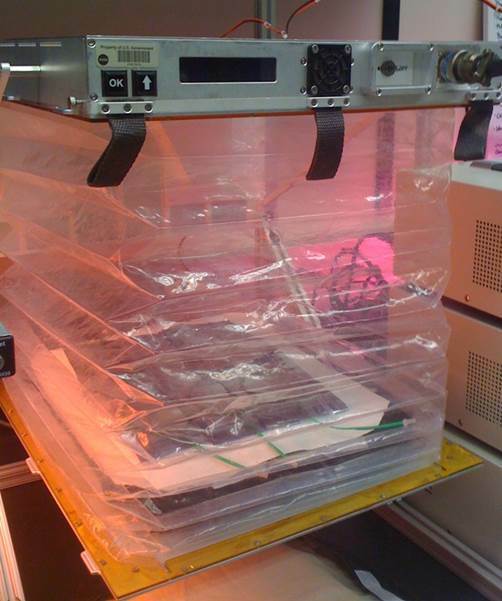 During spaceflight, far from Earth or on a long-duration mission, a totally sterile environment may not be what is desired. While you can’t have a pet dog or cat to make your living space a little more homey, perhaps you could have a pet plant to care for, as it provides oxygen and sustenance. Charlie Quincy has been the Space Biology project manager at Kennedy Space Center for the past 13 years. His efforts include both flight and ground research aimed at expanding the current science knowledge base, solving issues associated with long-duration spaceflight and distributing knowledge to Earth applications. He is a registered professional engineer and has a master’s degree in Space Technologies. 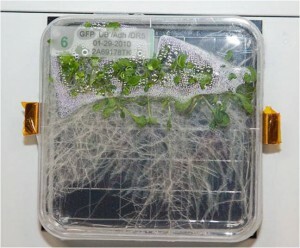 In today’s A Lab Aloft, Charlie Quincy, research advisor to the International Space Station Ground Processing and Research director at NASA’s Kennedy Space Center in Florida, shares the growing potential of plants in space and the new plant habitat that will help guide researchers. The blog continues in Part 2. There are forces that work together on this planet that we take for granted when it comes to how plants grow and thrive. Here at NASA’s Kennedy Space Center we are in the process of identifying those things and how we can engineer facilities that replicate them in the closed system environment of a space vehicle or habitat, such as the International Space Station. Within closed systems, there is limited or no exchange with the broader environment, we are specifically interested in closing the water, oxygen, and carbon loops for long duration space flight. We have found that plants have well defined processes to perform the conversions necessary to close loop when supplied with light energy. The wonderful thing about plants is that they pretty much know what they are supposed to do, as long as you give them an atmosphere they like. There are a couple of things that microgravity makes a little more tricky. There’s no convection mixing, for instance, in the atmosphere aboard the space station—which has a carbon dioxide (CO2) level of around 10 times what we see on Earth. Plants take in CO2 and give off oxygen. This process occurs at the stomata on the bottom of the leaf; without convection mixing or wind, you get high concentrations of oxygen around the stoma and no CO2 coming in. We need to learn how much air movement in the chamber is necessary to force the oxygen away from the leafs and allow the CO2 to replace it. Also, plants and their fruiting are very sensitive to various trace gases. Any time you have a closed system with little new makeup air being added, like aboard the space station, you have a buildup of trace gases. The gases, such as ethylene, that have a regulatory effect on plant growth need to be removed so plants can progress through their normal maturing process. Without the force of gravity acting on the plant, we also have to make provisions to ensure the stems grow toward the light and the roots grow toward the water. The secondary capabilities of plants to orient themselves are still being worked out in basic science investigations. Thinking about how this work relates to what we grow on Earth, Ray Wheeler, another NASA scientist, and I were in Chicago at a commercial activity called “The Plant” to see how the people there incorporate the concepts of bioregenerative farming into their operation. This is a group of people who took an old building, formerly a meat packing house, and are trying to create a closed ecological system. They use this environment to grow plants, produce products for their store, restaurant and production facilities, and they use the waste products to generate energy for the growth facility. NASA is interested in these facilities because they are a large venture compared to our space station operations, facing similar but different challenges. We are basically trying to do the same thing on a small scale; somewhere in the middle is what might be on a space habitat. We are setting up systems in balance and to make this balance we need to incorporate buffers and reservoirs and manage energy needs. We are looking for opportunities where people are having success in creating these balanced systems. Working with organizations like The Plant, we learn together and push information back and forth to achieve our mutual and specific goals. Urban farming is becoming more and more common around the world and our closed system space flight goals to manage energy use and producing fresh food have much in common. Working together with this broader community will bring more solutions into play and help to uncover the best options. Farming is no longer isolated to rural areas and the agriculture industry is growing to include urban farms. 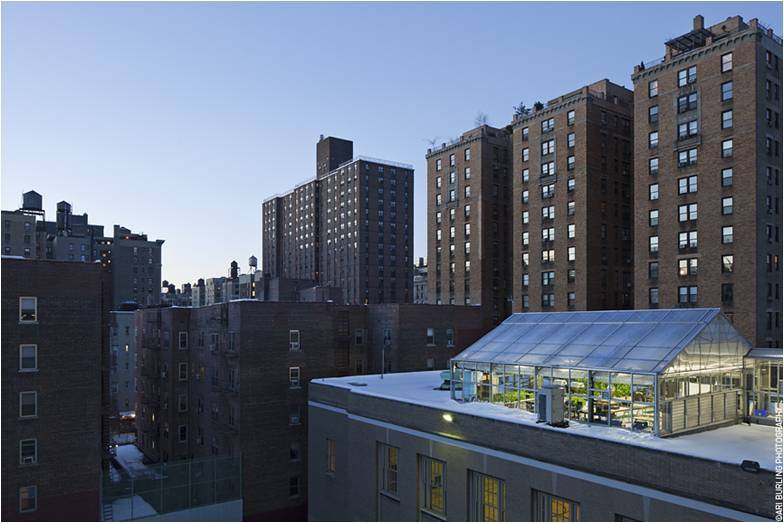 If you look at a city like New York, you’ll see little greenhouses on the roofs of almost every building. Many of those greenhouses are associated with the restaurants located on the first floor. If you have a Jamaican restaurant, for instance, they’ll have herbs and spices they’ve brought from Jamaica that they grow on their roofs. Farming for immediate use is exactly what we’re doing and we can learn from each other. Within our ground research activities at Kennedy we have tested a broad range of crops and support systems in our growth chambers over the years. We have published hundreds of papers on our results, many of which have broad application for the agriculture industry. We also have seen and published results on the impacts of trace gases on food production, as well as different colored lighting and photo periods on plant performance. This type of information can have a tremendous impact on our global agriculture industry. It’s really interesting how everything ties together. By pushing the boundaries and adding to our understanding of plant life we can continue to learn from each other and share benefits. 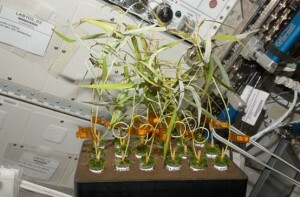 We can help plants on the ground and in orbit do what they do best: grow!